For every visible form there is an invisible counterpart separated by an unseen veil. This is a principle called the law of reciprocals, which states that anything not fully unified within has a hidden, entangled complement on the other side that integrates it into ONE whole thing. Whereas we have a time domain actual self that lives in direct space, we also have a spectral domain potential self that exists in reciprocal space. These two different aspects of ourselves represent the smallest, most indivisible components of our body, mind and spirit. Collectively, they are called automata and are known in science as the real and imaginary components of complex waveforms. 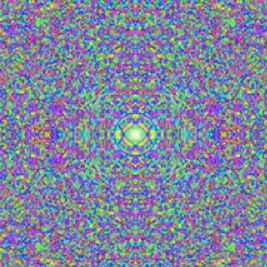 The video above illustrates how all geometries and wave shapes originate from combinations of these two components. However, in more realistic terms, they represent the parts that separate the player from the instrument in which we live…the operator from the machine. The real partials originate from the intentions of the player, whereas the imaginary parts stem from the interaction between the player and instrument. In the spectral domain these two aspects of reality are separate and discreet possible combinations of unassembled real and imaginary components. On this side, in the time domain, these two aspects are combined and assembled by intention into the vibrations that make up the matter, events and circumstances of our world. In each of life’s situations; health, relationships, finances, living quarters, careers and dreams, these two polar features come together to manifest our intentions. But, before they become manifest, they lie undetected on the other side. Intention has the ability to reach across the divide, combine these real and imaginary components and express them into material reality. A level of reality that the effect can be applied in. Current status of the object or person seeking change. A method of applying the change. Modern medicine attempts to effect change at the molecular level mostly through prescription pharmaceuticals. However, it is now known that these molecules are made from atoms that consist of primary particles that are actually just tiny vibrating strings. But what is the source of the strings? Our research has shown these to be vibrations or complex waveforms made from real and imaginary components. In our time domain all challenges have physical, mental/emotional and spiritual aspects, all of which must be addressed in order to be resolved. However, in the spectral domain all things are homogenous. It is therefore much more elegant and efficient to apply change at this more primal level of the automata. The mechanism the universe gives us to express our intention is voice and breath. Modern scientists are just now beginning to understand what yogis and mystics have known for centuries–that the life force animating our physical bodies is regulated by breath, and that the breath energy is connected to mind. Breath is the origin and destiny of the life wave that constantly courses though our body, mind and spirit. It is the soul of our being. Therefore, a spectral analysis of the breath is the preferred metric of choice to determine the current status of an individual. Thinking about something is purely imaginary, but when the thought is expressed, it sets everything in motion and writes the intention into the time record of manifestation. The ability of an intention to manifest itself is directly proportional to the quality of its expression. Human biometrics is focused only on physical changes. Our psiometric evaluation is more complete because it includes the mental, emotional and spiritual aspects as well as the physical components of change. The best of the transformative technologies include a method of feedback to the one seeking transformation. This feedback is usually in the form of a signal to either warn or inform the seeker that a particular goal has been achieved or blockage has been encountered. In addition, the feedback signal is usually a simple tone or light that signals the user. Furthermore, the data used to generate the feedback is static and must be collected and averaged over time. 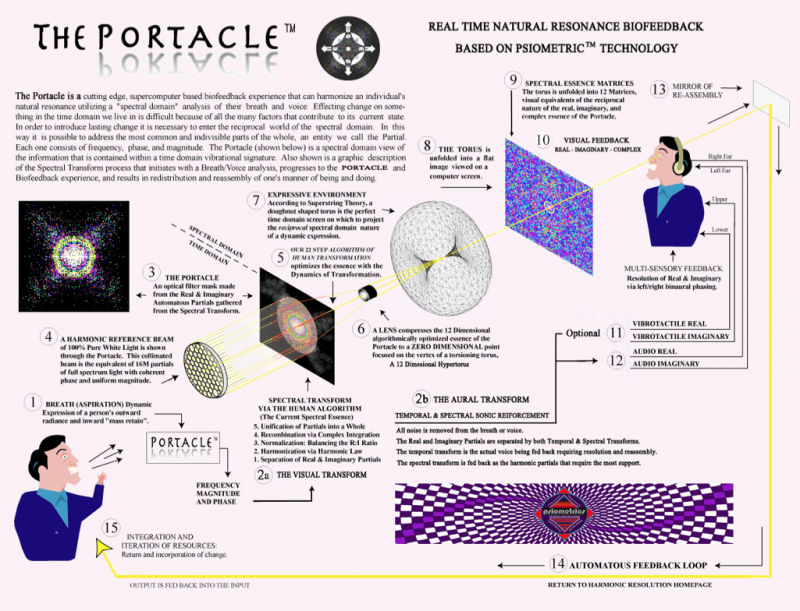 The Portacle provides a true natural form of dynamic feedback that iterates the harmonics requiring reinforcement back to the user via a multi-sensory system that allows them to see and hear what their intention looks like in the quantum world in real time. This synchronous experience is profoundly relaxing, yet extremely inspiring and results in a state of sensory resonance that can lead to higher states of order. The Portacle is an aperture or lens through the divide that separates the two domains. The user breathes, whispers or speaks into the microphone of their computer, which analyzes and provides the feedback in real time. The following diagram illustrates the Portacle™ process. 1. You breathe, whisper or speak or otherwise express your goals, ambitions, and intentions into a microphone connected to your computer. 2. The ambient noise of the room and dis-coherence of their current state are removed leaving only the partials that are related harmonically. 3. This optimized signature is then separated into real and imaginary components, and auditory and visual signals are generated and fed back in real time. 4. The real components are sent to the left ear while the imaginary components are routed to the right ear. Since the ears are separated, your brain is required to resolve the difference and hears it as binaural phase. An additional aural rendering emphasizes those harmonics that require the most reinforcement in order to optimize the signature, and this feedback signal is then combined with the first. 5. 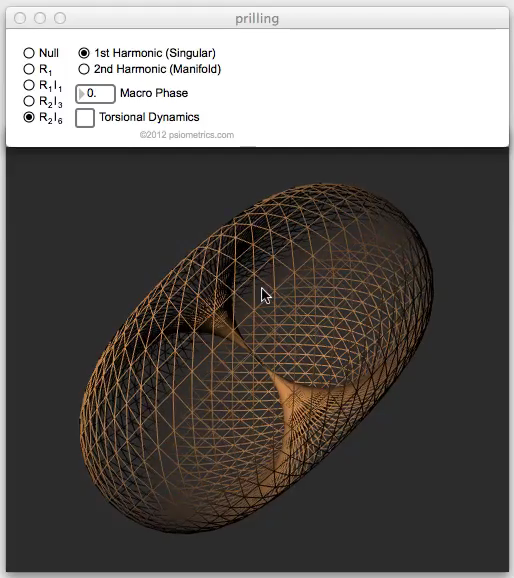 In addition to this aural feedback, you are stimulated visually with a model that plots the real and imaginary relationships of your intention onto the surface of a twelve dimensional toroidal space, the only topology on which to populate a truly complex dynamical system. This torus is then unfolded to reveal a map that we refer to as a spectral essence, an amazingly detailed mandala that is viewed on your computer screen. This quantum view of intention is powerfully engaging and can lead to an enhanced ability to visualize your own reality. It can be used as an “intentional palette” upon which to visualize your thoughts and intentions. 6. As an option, The Portacle can also provide kinesthetic or vibrotactile feedback as well to a hand held transducer, sound table or chair. 7. Continued appropriate use of The Portacle can lead to changes in both the internal and external environments. The changes wrought about within and around yourself are the final stage of The Portacle process. While the outer space of direct space is referred to as the universe, the inner world of reciprocal space is a place called the inuverse. All good things in life come from this innerspace. Every invention was first an idea inside someone’s mind. Children come from inside, and it can be demonstrated that the future itself originates in and radiates out from this “other side” of reality. At the center of this inuverse lies the origin of one’s personality. Here is found the essence of both the operator and the machine…the player and the instrument. All human suffering, indeed, all human experience stems from the difference between these two parts of oneself. This variance creates a tension, which functions as a black hole, drawing in anything that is resonant with resolving the difference and strain. Therefore, we are all black holes wandering around in space drawing in what we need to resolve these issues in order to become our one true self. 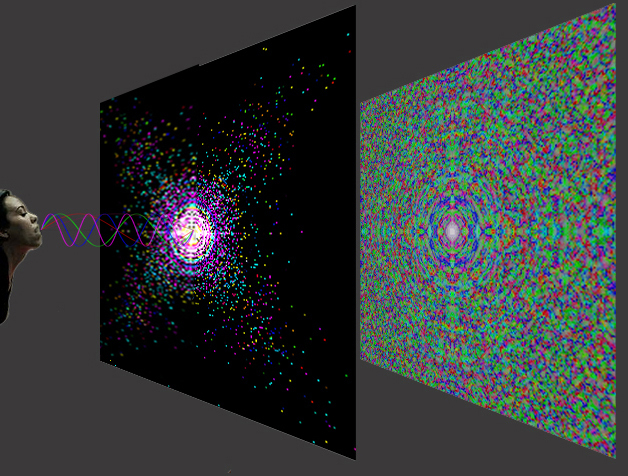 We are not objects walking around in space, but rather space wandering around in space. Origin lies at the center of all things. Origin and destiny are the alpha and omega of one’s life, and in most aspects…the same thing. 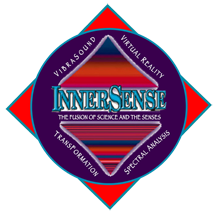 At the center of this inuverse lies the control room of a person’s machine or instrument. Within are the buttons, levers, and knobs that set up the next upcoming moment, in other words the super-conscious future. This seat of consciousness is sandwiched in-between the super and subconscious (future and past), and operates in the now. It is the living presence of the conscious mind…the operator or controller of the machine. When there is no sentient change in the present moment to reset the controls, the next moment will be more or less a repeat of the last one. Only when acted on in the present, can true and lasting change be achieved. Navigating to this obscure and far away point of origin isn’t easy. It requires a lot of determination, time and courage. It requires active pursuit (your part) the right tools (vehicle, map, directions, fuel, plan etc.) and dedicated support from someone who is willing to listen. The Portacle is a technology that can provide all three of these prerequisites by encouraging active pursuit through stimulating, engaging and mesmerizing feedback, providing the vehicle, map and directions to your next highest level, and offering guidance via indices and quotients that constantly give a reading on a person’s current state of being in real time. Having access to the controls that set up one’s future gives them the option of manifesting their own reality. The most important set of coordinates describing where a person is currently at in their life is distance and direction from origin. The Portacle is a compass/odometer that can help you determine those parameters and assist you in getting on a path to origin/destiny that is both elegant and efficient. We believe it to be one of the greatest tools for meditation, personal development and transformation ever developed. It is the essence of what is being called “spiritual technology”. The Portacle can bring about whole-brain synchrony via binaural phasing. 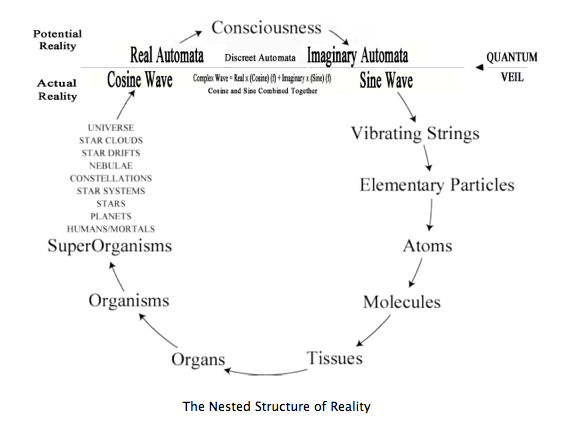 The different possible combinations of real and imaginary can be used to determine the real time status of awareness (in or out), energetics (work or rest) integration (connected or separate) and orientation (past, present, future) and other indices and quotients that relate to your current state of being. Automata are very mechanical as they represent the machine-like aspects of reality. Therefore, they are sensitive to time, periodicity and intensity. The more often you can experience them, the more periodic and ceremonial you can get with it, and the more intense you can make the experience, the more effective the process will be. Persons entering the Portacle are called Neuronauts who neuro-navigate through the Portacle. Showing up, being willing to experience whatever comes but not attached to outcome is the best attitude and state of mind with which neuronauts can enter the Portacle. The Portacle is calling you to your next highest level of order, the not yet manifested parts of you that lie beyond the quantum await your command!